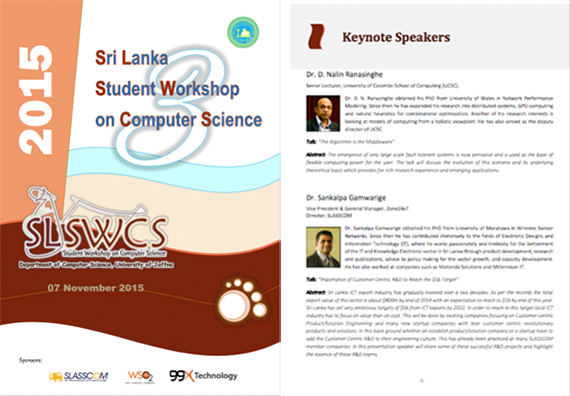 The Sri Lanka Student Workshop on Computer Science (SL-SWCS’15) will bring together research students from Sri Lanka for a one-day workshop which will be held at the Faculty of Science, University of Jaffna on the 07th of November 2015. This is the third student-focused workshop which is a proud initiative by the Department of Computer Science, University of Jaffna. The primary target group of this workshop is final year undergraduate, MSc, MPhil, and doctoral research students studying in Sri Lanka. The workshop provides a stimulating opportunity for young research students across the country to involve in discussions with some top researchers from local or foreign universities. Participants will also have the possibility to present results of their research activities and to interact with their scientific peers, in a friendly and constructive environment that would possibly lead to future collaborations. For this workshop, students are invited to submit high-quality posters of which the main author is a student. All posters will be reviewed and selected by an international and local pool of reviewers for either an oral or poster presentation. On the day of the workshop, there will be two keynote speeches from both academia and industry that would be delivered by the invited speakers to enlighten the Computer Science students in the state-of-the-art approaches in a research field and expectations of the stakeholders in the modern job market. As the main event of the workshop, about six to eight selected posters will be orally presented for about 20 minutes each followed by a question answering session. The rest of the posters will be presented by following a spotlight session of the workshop. Finally, there will be a panel of resource persons conducting an interactive session followed by an awarding ceremony for the best poster and poster presentation of the day. A “Best Presentation” and “Best Poster” prize will be awarded to the student participants who will be evaluated by the invited speakers of SL-SWCS’15. Final year undergraduate, MSc, MPhil and doctoral research students studying in Sri Lanka are invited to submit high-quality posters of which the main author is a student.